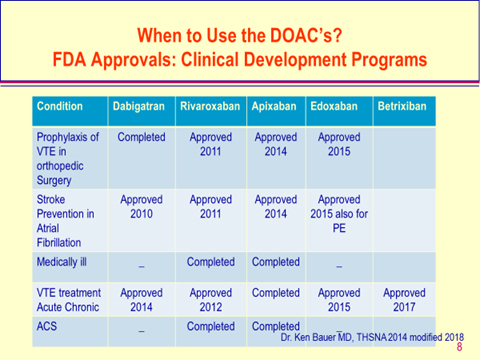 UPDATE ON THE DIRECT ORAL ANTICOAGULANTS (DOACs): WHERE ARE WE IN THE LABORATORY ALMOST TEN YEARS LATER? Vitamin E-, Ginseng, Garlic, Gingko Biloba, Feverfew, Fish Oil, Glucosamine. Ibuprofen- Advil, Excedrin, Medipren, Menadol, Midol-200, Motrin, Motrin IB, Nuprin, Pamprin-IB, Rufen, Saleto (200,400, 600, 800), Trendar, Indocin, Orudis (ketoprofen); Toradol (Ketoralac), Doan’s Pills, Magan, Modibin (Magnesium salicylate), Meclomen, Ponstel, Relafen, Alleve, Anaprox (Naproxen), Daypro, Feldene, Butazolidin, Amigenic,, Rexolate, Tusal, Tolmetin. Plavix, Prasugrel, Cangrelor, Ticagrelor, Ticlopidine, Coumadin, Pradaxa (Dabigatran), Rivaroxaban (Xarelto), Apixaban (Eliquis), Edoxaban (Lixiana), Betrixaban (Bavyxxa), Heparinoids, Argatroban, Bivalirudin, Lepirudin. 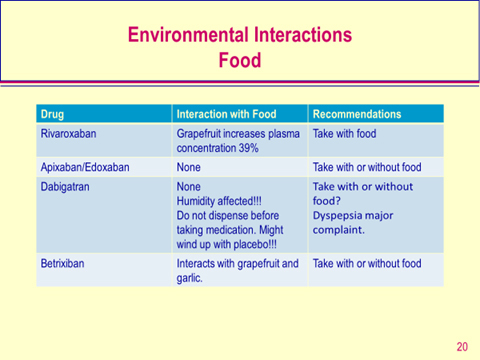 Numerous antibiotics, Dilantin, GRAPEFRUIT (Forbidden fruit?). Unfortunately the coagulation laboratory is still playing catch-up to measuring the effects many of these medications are having on the tests we use to monitor patients hemostatic state!! Purpose of Anticoagulation: First do no harm? In the 1980’s the onset of LMW heparins brought in the idea of not requiring monitoring. The need to monitor was dependent on having an effective assay and was limited to “special” populations: renal subjects, obese and underweight, pediatric and spontaneous abortion patients. The pharmaceutical industry has championed the need for no monitoring. (Good selling point). Chromogenic FX used to monitor DTI’s conversion back to Coumadin and for monitoring LA’s. 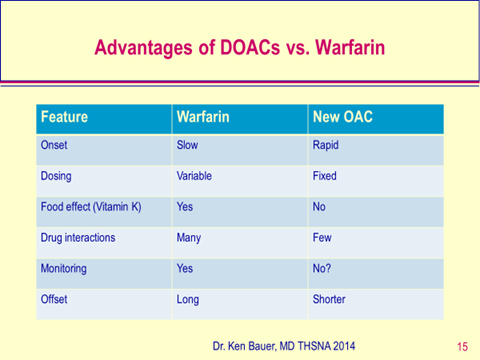 -When to Use the DOAC’s? Anticoagulant therapy is a constant challenge between efficacy and safety. The reference assay tests both PT/INR and APTT have major limitations when monitoring any anticoagulant. They became the standard by default. (no alternatives FDA-cleared to date with some anticoagulation medications). About 10% of patients who are treated with UFH have a prolonged APTT before starting therapy. How do you assess efficacy in this situation? – What happens if a lupus anticoagulant is present? People still quote the original 1.5−2.5 times “something” as acceptable UFH therapy. This was based on reagents used in the 1980’s. I still get asked for control PT/INR and APTT results. May be due to VKORC-1 gene mutations. But rarely ordered. – The fewer the patients in a practice the lower the TTR. – Some anticoagulation clinics have thousands in their population. Drugs that have been used for 50+ years still have major issues for safe use. Pharmacogenomics have important roles in predicting or monitoring therapies for Coumadin/aspirin/Plavix/UFH/LMWH/DTI’s, Anti-Xa. (Rarely ordered). Are we naive enough to think any anticoagulant drug is inherently safe? The PT/INR and APTT/anti-Xa are used to quantify drug efficacy to make sure the therapy is working. Levels of any of these lab values if high or low usually lead to adjustments of doses and or complications of bleeding or clots. In modern medical practice safety considerations are important QC metrics. In the past 20 years the laboratory has scrambled to monitor new drugs. LMW heparins (4) [anti-Xa]: (enoxaparin, nadroparin, tinzaparin, dalteparin). – Dosing controversy: 110 mg or 150 mg? Dabigatran is an oral anti IIa inhibitor very heavily advertised on TV for Atrial Fib. Available in US for just over 8 years. Short Half Life (12-17 hours). Peaks at 1.5-2.0 hours following the last tablet ingestion. 80% Renal clearance so really influenced by renal function. Will affect half-life. Randomized Evaluation of Long-Term Anticoagulant therapy (RE-LY) trial: Reduced stroke deaths risk of dying by 70%. (Stroke April 2012). DOD study showed compliance was better with dabigatran than Coumadin: 64% vs 41%. Results from phase ½ study showed agent can produce sustained reversal of dabi-anticoagulation in healthy human volunteers. No toxicity. Still may not stop bleeding even though drug level reduced. Not being used as much. Being replaced by the Anti-Xa inhibitors due to less gastric distress. Dose of 15 mg if CrCl is 15-50; 20 mg if CrCl>50. Elective Surgery discontinuation 3-5 days? Arbitrary…. AVERROES: ASA vs Apixaban [trial stopped early because of clear benefits in regard to stroke reduction favoring Apixaban]. Hazard ratio 0.46%; 95% CI 0.33-0.64; p<0.001. Results showed rates of major bleeding similar to ASA. Better tolerated than ASA with fewer study drug stoppages. ARISTOTLE trial compared Apixaban with warfarin for prevention of stroke and system embolism (SE) in AF subjects. Apixaban better tolerated than Warfarin with fewer drug discontinuations. ENGAGE AF-TIMI 48 trial randomized >20,000 subjects with AF and elevated CHADS score compared to warfarin. – FDA cleared in January 2015. Used extensively in Japan and Europe. Edoxaban Reversal of effects in emergency situation were studied on bleeding times (“curses”) in rats PT in human plasma. Reversal agent is Annexa.. Oral direct inhibitor of factor Xa for the prophylaxix of venous thromboembolism (VTE) in adult patients. ALL OF THE ABOVE ITEMS ARE NOW FDA APPROVED. Ecarin clotting time, Hemocot Thrombin Inhibitor and Dilute Russell Viper Venom Screen or Confirm (ECT/HTI/DRVVC) may be used for Anti-IIa DOACs in quantitative assays. The Anti-Xa DOACs have no effect on ECT, HTI but the DRVVC method may be affected by all of the DOACs. The DRVV-DOAC phospholipid may be used to assay all the DOACs. Sennesael AL et al Thrombosis Research 2019. Anti-Xa tests are usable: high variability between assays. Factor Xa assays designed for heparin need to be adapted: too sensitive and developed for the catalytic inhibitor heparin; incubation times have strong interference in individual methods. Specific calibrators for the tested anti-Xa’s need to be used and matrix effect checked. Assays need to cover the expected therapeutic range (100-400 ng/ml) present good linearity and recover in plasma. LC-MS/MS is considered the gold standard but still has inter-lab variability and that external quality controls like those used for coagulation testing are a necessity. Major correlation studies are needed to establish international standards. If we have learned nothing during the past 50 years it’s that the idea of anticoagulant drugs never requiring monitoring is flawed, no matter what the FDA says. “ A lot of people think that when you don’t need to monitor a drug, you don’t’ need to test for the drug.” Dr. Michael Laposata MD, Ph.D quoted in CAP Today, January 2012. “Short half life of new drugs means missing a dose could lead to clotting issues quicker than missing a warfarin dose.” Compliance is a huge issue! Dr. Mark Wuster M.D. THSNA 2012! How do you set up a test for a drug not requiring monitoring? Are there any tests available? To date no DOAC-specific tests are licensed for use in either the United States or Europe. There is limited availability in Europe and less in the United States. Can we modify what we currently do? Despite the FDA mandate for no monitoring, past experience tells us that is not going to be true. The same rationale for testing children, the obese, pregnant woman, acutely ill patients, elderly & other “special” populations will likely force safety testing. The lack of FDA approved testing is an impediment. Need for validation testing will not be easy. Impact of the FDA position needs to be clarified (risks of laboratory developed tests: LDTs). Where does CAP stand on this? Currently all testing is technically RUO. More oral drugs are on the horizon. Big Pharma is not going to suggest monitoring for any of these. Certain defined populations will be at higher risk for bleeding and maybe clotting. Labs will have to develop strategies to provide safety testing data for these new drugs. Who do we compare testing with? IV administered synthetic small molecule; reverses rivaroxaban, apixaban, edoxaban, betrixiban and dabigatran, heparinoids and fondaparinux in preclinical studies. Reduces aPTT in Xa drugs; PT in IIa meds. Approved. Higher affinity to Xa than IIa. Is there a rapid test (POCT) available for detection of DOACs? Recently in a manuscript by Job Harenberg, Semin Thromb Haemost 2018. The authors describe a rapid test on urine for detecting Anti-IIa and Anti-Xa DOACs using a dipstick test that only takes 10 minutes. This assay would give emergency rooms and the lab a quick turn-around-test in emergency situations to determine the presence of DOACs. 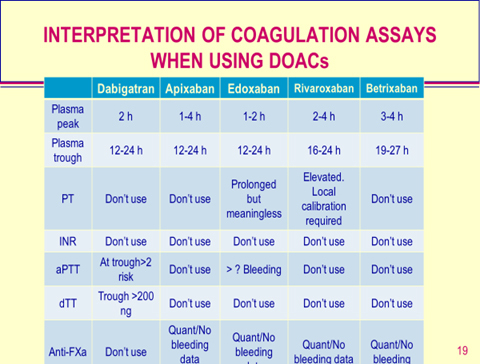 All of the DOACs are excreted in variable amounts in the urine but without the presence of coagulation factors and inhibitors (specific and non-specific) that may interfere with the plasma coagulation testing. With the exception of Betrixiban all of the DOACs are excreted into the urine (25-80%.). Betrixiban is the exception with <7% being cleared by renal function*. Therefore, creatinine levels should be run in parallel with the DOAC measurement to determine the renal function of the DOAC recipient. The test is simple. The DOAC Dipstick is dipped in the urine sample for 2-3 seconds and then allowed to dry for 10 minutes and observe for a color change. The color changes can be visually observed to determine the positive or negative results. These color changes are available in the testing package insert. An abnormal color of the urine specimen could interfere with the color determination to detect the presence of DOACs. 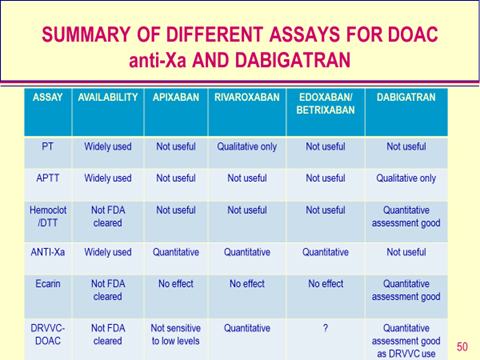 *Because of the low renal clearance of Betrixiban this assay may not be able to pick up the presence of this DOAC. Information is needed to verify this observation. Can DOACs be removed from plasma samples to prevent interference with plasma coagulation and chromogenic testing? In the last few years a product has been developed that can remove DOACs from plasma to remove the effect that these medications have on almost all of the coagulation clottable methods. 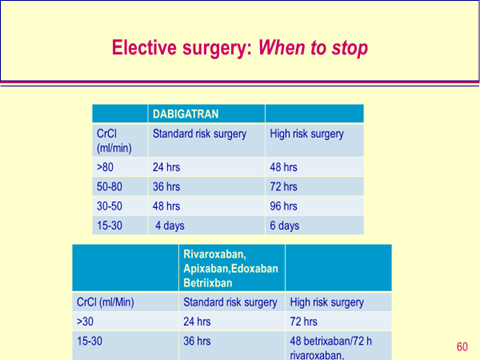 DOAC-Stop (Haematex Research, Hornsby, Australia) treatment has been shown to remove the effects of DOACs to include dabigatran, apixaban, rivaroxaban and edoxaban from spiked and patient samples. It was found to remove false positive results in lupus anticoagulants, APTT, DRVVT Screen and DRVVConfirm, PT/INR, Thrombin clotting time, Anti-FXa, Antithrombin, Protein C, Protein S, APC-R and Plasminogen. The testing was performed by adding one tablet of DOAC-Stop (Haematex has proprietary information on composition of reagent tablets) to 1.0 ml of citrated plasma. The specimen is gently mixed for 5 minutes and centrifuged for 2 minutes at 2,000 g to precipitate DOACs with the adsorbent tablets. The supernatant is then separated for analysis. It was found to remove false positive results in lupus anticoagulants, APTT, DRVVT Screen and DRVVConfirm, PT/INR, Thrombin clotting time, Anti-FXa, Antithrombin, Protein C, Protein S, APC-R, Factor VIII (clottable and chromogenic), and Plasminogen. This product gives the laboratory a way to test subjects on DOACs without the interferences they can cause on the above methods. In a recent article in Blood 2018 by JM Connors the author discusses the issues of DOAC measuring in the almost 10 years these drugs have been in use. It is obvious in certain clinical situations the physicians and the laboratory should work to have tests available to render patient care when the DOACs are present. I will never forget my first calls for an anesthesiologist who called our laboratory and said “What the Hell is Pradaxa. His family told us he was off coumadin but said nothing about any other blood thinner.” Or a laboratory who called wanting to know what tests to use in monitoring Pradaxa. They had a patient with atrial fibrillation come in through the EC on the weekend. They couldn’t convert her and put the patient on Pradaxa and sent her home with follow-up scheduled. Her daughter went to check on her and the subject had fallen and hit her head and bled out and expired. This was back in 2011. We have come a long way with testing for DOAC specific methods. However, to date we have limited test availability in Europe and almost none in the United States. No assays are licensed. 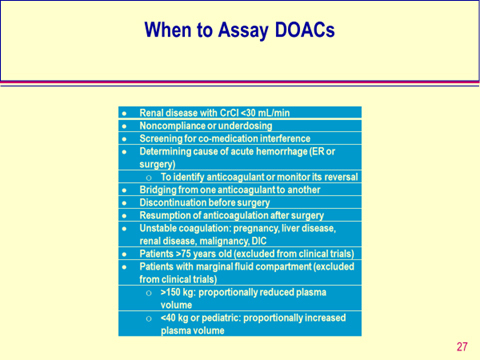 The assaying of DOACs should be available in certain critical clinical situations such as life- threatening hemorrhaging, emergency surgery, changes in patient health issues. This is especially important with the emergence of the reversal agents for DOACs. As usual more study is needed but the agencies such as the FDA need to give the physicians and the laboratorians the tools to solve these issues. McGlasson DL, Fritsma GA. Measuring Dabigatran with the Dilute Russell Vivper Venom Confirm Assay in an Anticoagulation Clinic Population. 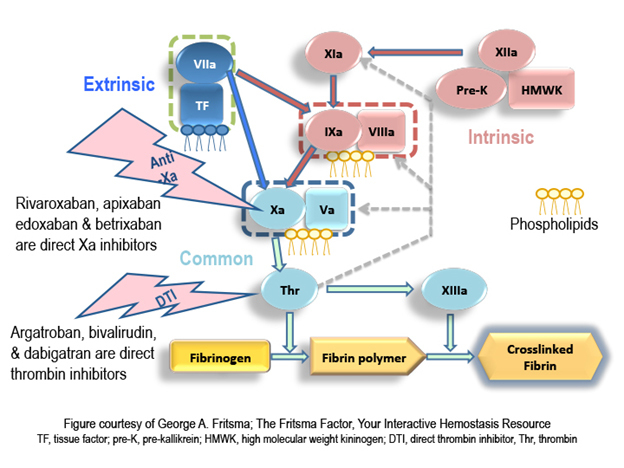 Blood Coagulation and Fibrinolysis. 2016;27(1):53-57. Gosselin RC et al: International Council for standardization in Haematology (ISCH) Recommendations for Laboratory Measurement of Direct Oral Anticoagulants. Thromb Haemost 2018;118:437-450. Connors JM. Testing and monitoring Direct oral anticoagulants. Blood 2018;132(19):2009-2015. 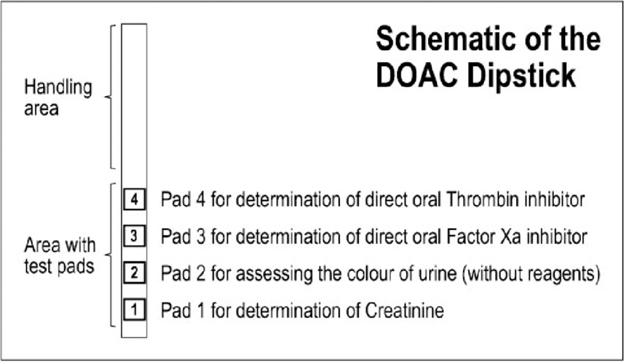 Harenberg J et al: Detecting Anti-IIa and Anti-Xa Direct Oral Anticoagulant (DOAC) Agents in Urine using a COAC Dipstick. Semin Thromb Hemost 2018 DOI 10.1055/s-0038-1668098. Platton S, Hunt C. Influence of DOAC Stop on coagulation assays in samples from patients on rivaroxaban or apixaban. Int J Lab Hematol 2018. DOI 10.111/ijlh 12950. Favresse J. et al: Evaluation of the DOAC-Stop Procedure to Overcome the Effect of DOACs on Several Thrombophilia Screening Tests. Favresse J et al: Evaluation of the DOAC-Stop Procedure to Overcome the Effect of DOACs on Several Thrombophilia Screeing Tests TH Open 2018:2e202-e209. Exner T et al: Simple method for removing DOACs from plasma samples. Thromb Res. 2018 Mar;163:117-122. Farina N, Miller JT. 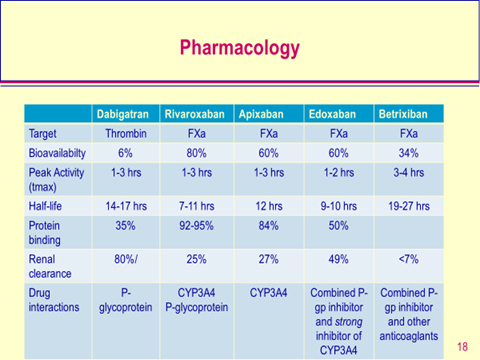 Pharmalogic Reversal of Direct Oral Anticoagulants. Crit Care Nurs Q 2018;41(2):121-128. 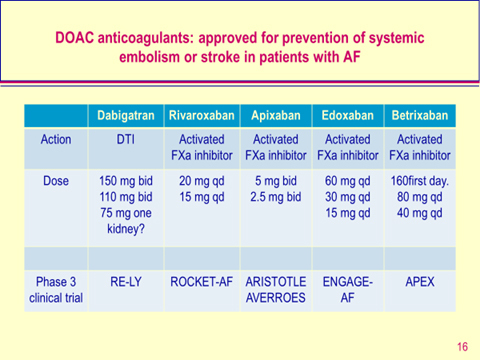 Favaloro EJ et al: Laboratory Monitoring or Measurement of Direct Oral Anticoagulants (DOACs): Advantages, Limitations and Future Challenges. 2018 Current Drug Metabolism 2017, 18;598-608. Novel Assays in the coagulation laboratory: A clinical and laboratory perspective. Novel assays in the coagulation laboratory: a clinical and laboratory perspective. 2018 57:480-484. Sennsael A-L et al: An optimized dRVVT-based assay to estimate the intensity of anticoagulation in patients treated with direct oral anticoagulants. Thrombosis Research 2017 157:29-37. Ratzinger F et al: Lupus-anticoagulant testing at NOAC trough levels. Thromb Haemost 2016 116(2):235-40. Douxfils J et al: Mass spectrometry in the therapeutic drug monitoring of direct oral anticoagulants. Useful or useless? 2016 Trends in Analytical Chemistry DOI: 10.1016/j.trac.2016.01.029. Siriez R et al: Betrixiban: Impact on Routine and Specific Coagulation Assays-A Practical Laboratory Guide. 2018 Thromb Haemost. 118(7):1203-1214. LJ van Pelt et al: The DaXa-Inhibition assay: A concept for a readily available, universal aXa assay that measures the direct inhibitory effect of al anti-Xa drugs. 2018 Thromb Res 168:63-66.